Simply pair your smart device with the PK7 via Bluetooth for seamless streaming of your top tunes wirelessly. The LG XBOOM has easy voice interaction so that with the press of a button you can activate your phone's smart assistant feature. Request a song, control music playback, and engage other voice-interaction functions. This feature requires an Android or iOS device with voice activation technology and music streaming service subscription. 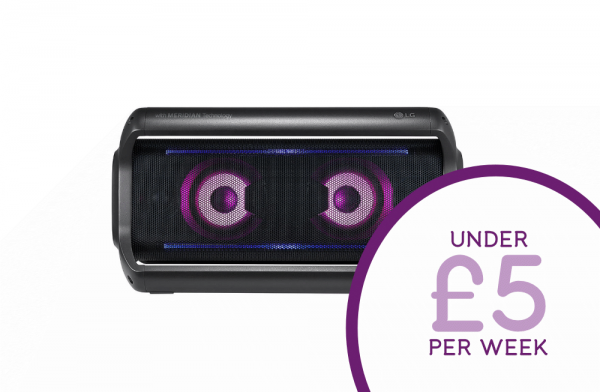 The Speaker also offers Multi Colour & Mood Lighting, X-Grip Design, High Fidelity Bluetooth, IPX5 rated water resistance and a brilliantly lengthy battery life of upto 22 hours. Live Loudly, Pay Weekly.